Human Rights Watch say that barrel bombs embedded with cylinders of chlorine gas were dropped on three towns. 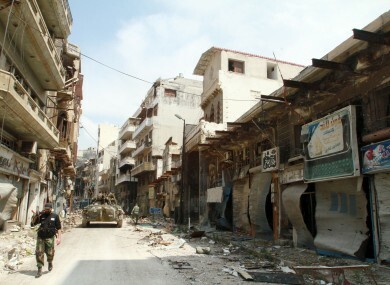 Pro-government troops patrol the old city of Homs. EVIDENCE “STRONGLY SUGGESTS” Syria’s government has used chlorine gas on three towns in mid-April in violation of the chemical weapons treaty Damascus joined last year, Human Rights Watch has said. “Evidence strongly suggests that Syrian government helicopters dropped barrel bombs embedded with cylinders of chlorine gas on three towns in northern Syria in mid-April 2014,” HRW said. The New York-based group cited interviews with witnesses and medical personnel, video of the attacks and photographs of the remnants of barrel bombs. Doctors who treated victims said at least 11 people were killed in the attacks and “symptoms consistent with exposure to chlorine” were seen in nearly 500 people, the watchdog reported. It documented attacks on the towns of Kafr Zita in central Hama on April 11 and 18, Al-Temana in Idlib on April 13 and 18 and Telmans also in Idlib province on April 21. All three are areas under rebel control. Opposition sources have claimed several government attacks using chlorine gas, and Syrian state television acknowledged one such attack in Kafr Zita but blamed it on the jihadist Al-Nusra Front. But opposition activists say the chlorine is delivered by barrel bombs dropped from helicopters, which only the government possesses. HRW said video of barrel bomb remnants at the site of the attacks showed cannisters with the code CL2 — the symbol for chlorine gas. But it said that it was unlikely the footage was staged or that the chlorine gas was added to the barrel bombs, citing symptoms reported by doctors and witnesses “consistent with exposure to chlorine”. “Syria’s apparent use of chlorine gas as a weapon — not to mention targeting of civilians — is a plain violation of international law,” said HRW deputy Middle East and North Africa director Nadim Houry. This is one more reason for the UN Security Council to refer the situation in Syria to the International Criminal Court. Syria joined the Chemical Weapons Convention last year as part of a deal to surrender its chemical weapons arsenal after it was accused of a sarin attack in the suburbs of Damascus. Possessing chlorine is not a violation of the convention, but using the gas as a weapon is, and the Organisation for the Prohibition of Chemical Weapons watchdog has said it will send a team to Syria to investigate the chlorine attack claims. Email “There is "strong evidence" that the Syrian government used chlorine gas in attacks on rebels”. Feedback on “There is "strong evidence" that the Syrian government used chlorine gas in attacks on rebels”.